runjoey: 5k's and Cross Country. Who would have guessed? 5k's and Cross Country. Who would have guessed? Well, it has been an unusual year but more on that at the end of year review. For now lets talk XC. It seems I've now have raced a 5k XC course 3 times in the past 5 weeks and at mid year I had not planned on any of them. 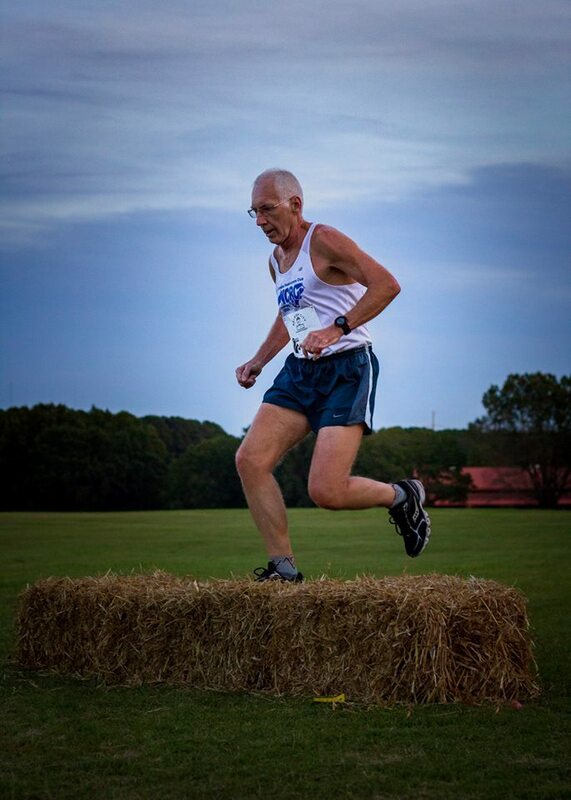 On Oct.23rd I ran the Sir Walter Miler Pop Up XC Championship race for fun and representing the NCRC team. 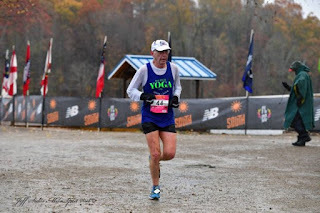 It was just 3 days after a warm humid half marathon and I wasn't expecting to do very well. The course is 3 laps on energy sucking thick grass and I was not feeling it during my warm up and a nice night for running. I ran hard and was a bit surprised at the pace on the first lap but it felt hard but then as lap 2 began I suddenly felt very good. Each of the next two laps were slightly faster and my final time of 24:12 was very satisfying. I was really expecting to be hard pressed to go under 26!! Two weeks later in what was definitely a last minute decision I ran the Global Run 4 Water at Wake Med Soccer Park. Bella wanted to race a non school event and Laura asked me to help find a race and this one popped up. I have been a spectator at meets there and run the course a couple of times but never raced so I decided this would be a good day for it. 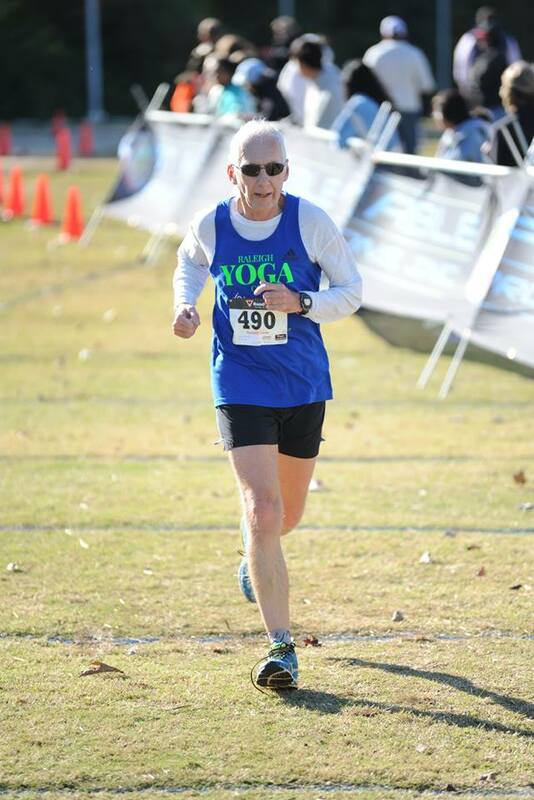 It was on Nov. 10th, just 6 days after the City Of Oaks half on a chilly , windy morning. I wasn't expecting any competition but when I approached the start I saw a friendly rival, Tim Beck whom I have raced many times over the years at these shorter distances. More times than not he is ahead of me but on a good day like the last time we met at the Run For the Roses I can get a win. At the start he moved well ahead pretty quickly so I figured it was going to be his day. Its a fast downhill start on this course and at the half mile I was well ahead of expected pace. By the 1 mile I was closer to what I hoped was my overall pace in 7:20. Mile 2 is the tough one on this course with a grind up the hill by the field and then a couple of steeper but shorter hills on the backside. At 1.5 I noticed I was closing the gap on Tim a bit so I was pushing as hard as I could. Mile 2 was a slow 8:00 but I had cut Tim's lead in half. From the top of the hill at 2 it's a nice gradual flat and downhill for the next 3/4 mile and I just put the hammer down and half mile later I had to decide whether to stay behind him or make the move now and hope I could hang on. I figured I couldn't rely on a kick today so I made the pass with authority. But 1/4 mile later as we began the 2nd trip up the hill and into a now 20mph headwind I could hear him coming back and when he went by I tried to hang on but it was not going to be. He ran strong to the finish while I felt like I was crawling up the hill. Mile 3 was a decent 7:37 and final time was 23:39, just 9 seconds l slower than I had planned so not a bad day on a tough course. 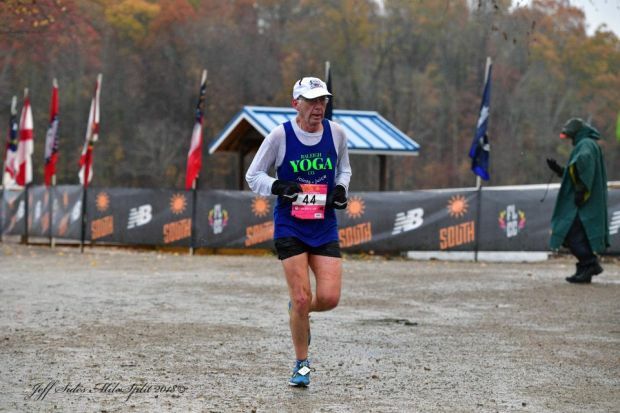 And then this past weekend, Nov. 24th it was a return trip to the Foot Locker South Regional at McAlpine Creek Park in Charlotte. I ran there two years ago and was happy with a 22:39. I knew going in that I wasn't quite in that kind of shape but was hoping for at least a sub 23. The weather had other ideas. I awoke to 34F and heavy rain with wind gust in the teens. I arrived at the park and was dreading getting out of my car and I did wait until the last minute to get out and get my 1 mile warm up before lining up at the start. Brrrr, that was some cold rain. The course was puddles and standing water for a good portion and soft everywhere else. I took off at a good pace but had to run in the grass and mud for the 1st qtr mile to get around some slower folks. They run the open and masters, male and female in the same race but do the results separate for each class according to chip times so a wide variety of competitors. I got my first bit of feedback at the 1 kilometer post and it wasn't good. I needed at least 4:35 but it was 4:42. I tried to push it but it was just slow going as I hit mile 1 in 7:42. about 20 seconds slower than in my workout on Tuesday ! It was very deflating and jogging the rest of the way crossed my mind for a nano second. I was cold and miserable and running as hard as I could knowing there was no reward or fast time awaiting me. But as always I chose to put the hammer down harder and make the most of it. I was steadily passing people and that help keep me focused. The one big hill comes at almost the halfway point. I felt ok going up and it's only about 200yds long. Because of the slickness the steep downhill was a bit trickier than usual but once I made it safely it was hammer time again. I used the momentum up the 2nd shorter hill and then rolled down to the lake for the first time. I hit mile 2 in 8:05 and headed out for the back loop which was really in dicey condition but its pretty flat other than a slight rise about halfway around. I just kept pushing and still passing a few folks. It was kind of weird because other than being cold and wet I actually felt pretty good and was running a strong race but the course was sucking about 20 seconds per mile out of my effort. That's just the nature of these things. And like most 5k's they are over pretty soon and there I was at mile 3 in 7:42. And then in the last tenth a guy passed me, the only one since the 1st k. I tried to hang but couldn't muster any more speed. Done in a disappointing time of 24:07, but considering the conditions I was quite happy with the effort I put into it. I know I gave it my best. I placed 35th out of 49 in the masters as I was racing everyone from 40 up. They didn't even list peoples ages but I didn't notice but one or two guys that looked near 60 . After changing into dry clothes and warming up I got out to watch the Frey girls compete which is always fun and thankfully the rain had stopped. Most likely I will race once more this year. Its a 5k but not cross country. I really hope I can at least get the sub 23 so stay tuned. It won;t be long before it's time for the year in review and looking a head to a big year in 2019.